This past weekend I had the good fortune to experience two vastly different artworks that drove home similar, albeit subliminal, messages for me. Alice Gosti's "Material Deviance in Contemporary American Culture," at On the Boards, and John Luther Adams' "Become Desert," at the Seattle Symphony, each reminded me of the elemental necessity of slowing down, of existing in each moment as it arrives, of setting aside the inane and often frustrating drone of daily life that seems to stifle my spirit these days. 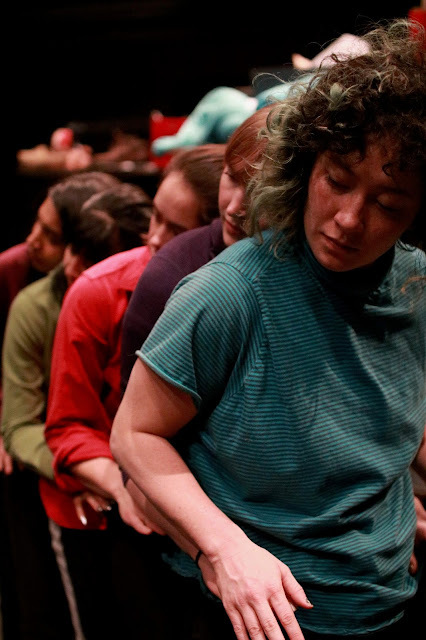 Gosti and her collaborators, including composer Hanna Benn and dancers Alyza DelPan-Monley, Sruti Arun Desai, Imana Gunawan, Tess Keesling, Lorraine Lau and Kaitlin MCcarthy, unveiled "Material Deviance" after months of development and refinement. Unlike many hipper art lovers in Seattle, I came relatively late to Gosti's immersive dance/installation/performance pieces. I went to see her 2015 durational work "How to be a Partisan," at St. Mark's Cathedral intending to stay for an hour. I was transfixed, and wound up staying for almost three. 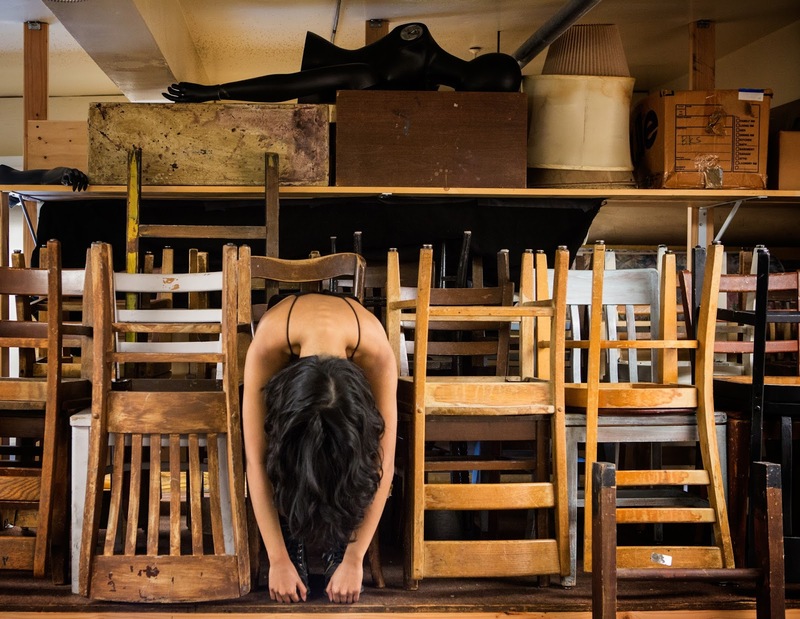 In this, and subsequent durational works, Gosti wove together seemingly disparate vignettes into a performance that left me no choice but to slow down and settle into her world. With "Material Deviance," Gosti had to distill her usual artistic trajectory into just over an hour, no easy feat. Like the set for this show--an installation of rolling shelves jam-packed with the detritus of our consumer culture--Gosti has a lot she wants to say. The program includes pages of text, reflections on the power that our objects hold over us. The performance itself was not nearly so cluttered (aside from the set). "Material Deviance in Contemporary American Culture"
"Material Deviance" begins with one dancer, Gunawan, standing still in front of the shelves, Benn's slow drone framing her. One by one, the other cast members emerge from darkness and strike their own poses, their stillness a contradiction to the noise of all that stuff. Like Gosti's earlier durational pieces, "Material Deviance" is episodic. 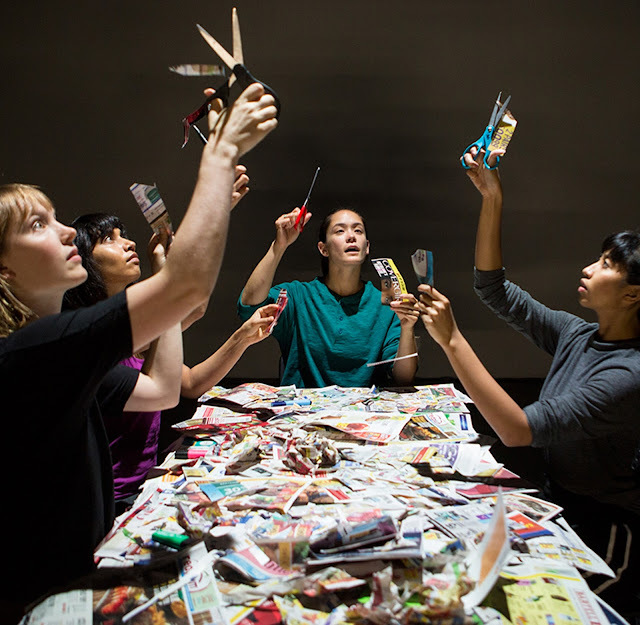 The dancers move the shelving to signal new scenes; they unfold tables and chairs, snip newspapers into shreds, pull tote bags and backpacks off the shelves. What lingers in my memory are evocative moments that seemingly had not so much to do with stuff: five women lying prone on the stage, passing Gunawan between them, balanced her on the soles of their feat and the palms of their hands; a transcendent Lau dressed in a tangerine dress that floats behind her as she moves in a slow arc, gazing up into the lights. "Material Deviance in Contemporary American Culture" left me thinking not about our obsession with objects so much as it reminded me of our fundamental human nature. To appreciate Gosti's work, we must slow down, match our heartbeats to her rhythms. Across town, the Seattle Symphony Orchestra presented the world premiere of composer John Luther Adams' "Become Desert," companion to his Pulitzer Prize-winning work "Become Ocean." Both were commissioned by SSO. Like "Material Deviance," "Become Desert" is an immersive experience, with some of the orchestra members arrayed above the main floor, and a choir above us in the highest balcony. Onstage, Ludovic Morlot leads the musicians in a slow sonic recreation of the Sonoran Desert, beginning with daybreak--crisp violins and clear bells. The sound builds around us as the winds, then brass, then choir add their separate sections to the whole. Suddenly, the audience is in full daylight under cerulean blue skies. Clouds arrive, a stormy percussive duet that ultimately delivers us back into stillness, the day ending as it began. Morlot, baton in the air, holds the audience in silence for many seconds, then slowly lowers his arms. We exhale as one. The New York Times' music critic described "Become Desert" as meditative. I'd use the words like commanding or captivating. Like Gosti, Adams requires the audience to slow down and accept each section of his music as it arrives, to let the sounds seep into our psyches. He says each note is carefully planned, but the immediate experience of "Become Desert," like my experience of "Material Deviance," was visceral, not intellectual. In a pre-show interview, Adams said his work begins in solitude and is completed in community. He was, I believe, referring to working with Morlot and the orchestra; he could easily have been talking about the audience experiencing together in Benaroya Hall. Adams eagerly seizes opportunities to record his music, but I think the power of live performance cannot be overstated. Sitting in the proverbial room where it happens, we come into synch with the art, the artists, our fellow audience members, and for me at least, with something bigger than myself.